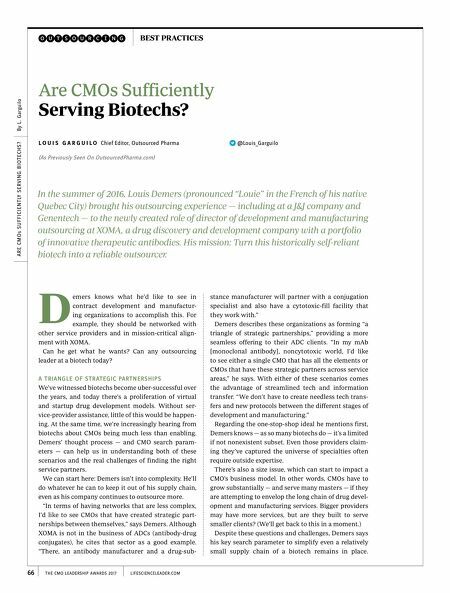 By L. Garguilo ARE CMOs SUFFICIENTLY SERVING BIOTECHS? BEST PRACTICES Outsourcing LIFESCIENCELEADER.COM THE CMO LEADERSHIP AWARDS 2017 66 stance manufacturer will partner with a conjugation specialist and also have a cytotoxic-fill facility that they work with." Demers describes these organizations as forming "a triangle of strategic partnerships," providing a more seamless offering to their ADC clients. "In my mAb [monoclonal antibody], noncytotoxic world, I'd like to see either a single CMO that has all the elements or CMOs that have these strategic partners across service areas," he says. With either of these scenarios comes the advantage of streamlined tech and information transfer. "We don't have to create needless tech trans- fers and new protocols between the different stages of development and manufacturing." Regarding the one-stop-shop ideal he mentions first, Demers knows — as so many biotechs do — it's a limited if not nonexistent subset. Even those providers claim- ing they've captured the universe of specialties often require outside expertise. There's also a size issue, which can start to impact a CMO's business model. In other words, CMOs have to grow substantially — and serve many masters — if they are attempting to envelop the long chain of drug devel- opment and manufacturing services. Bigger providers may have more services, but are they built to serve smaller clients? (We'll get back to this in a moment.) Despite these questions and challenges, Demers says his key search parameter to simplify even a relatively small supply chain of a biotech remains in place. emers knows what he'd like to see in contract development and manufactur- ing organizations to accomplish this. For example, they should be networked with other service providers and in mission-critical align- ment with XOMA. Can he get what he wants? Can any outsourcing leader at a biotech today? A TRIANGLE OF STRATEGIC PARTNERSHIPS We've witnessed biotechs become uber-successful over the years, and today there's a proliferation of virtual and startup drug development models. Without ser- vice-provider assistance, little of this would be happen- ing. At the same time, we're increasingly hearing from biotechs about CMOs being much less than enabling. Demers' thought process — and CMO search param- eters — can help us in understanding both of these scenarios and the real challenges of finding the right service partners. We can start here: Demers isn't into complexity. He'll do whatever he can to keep it out of his supply chain, even as his company continues to outsource more. "In terms of having networks that are less complex, I'd like to see CMOs that have created strategic part- nerships between themselves," says Demers. Although XOMA is not in the business of ADCs (antibody-drug conjugates), he cites that sector as a good example. 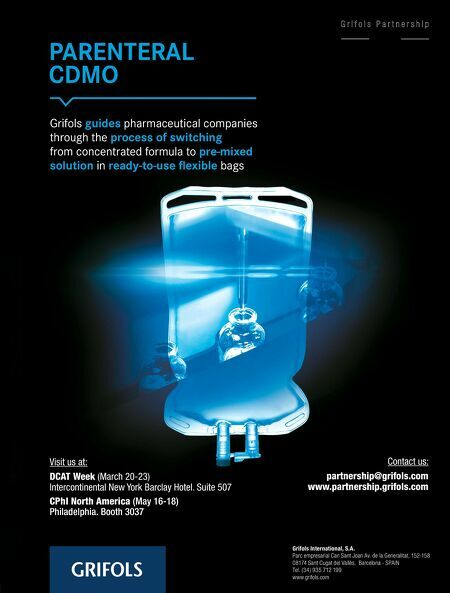 "There, an antibody manufacturer and a drug-sub- D Are CMOs Sufficiently Serving Biotechs? L O U I S G A R G U I L O Chief Editor, Outsourced Pharma @Louis_Garguilo (As Previously Seen On OutsourcedPharma.com) In the summer of 2016, Louis Demers (pronounced "Louie" in the French of his native Quebec City) brought his outsourcing experience — including at a J&J company and Genentech — to the newly created role of director of development and manufacturing outsourcing at XOMA, a drug discovery and development company with a portfolio of innovative therapeutic antibodies. His mission: Turn this historically self-reliant biotech into a reliable outsourcer.